Gotcha again! Herald On Sunday article on Grant Norman Kings sentencing and public exposure 5/8/12 (and commentary below). And here he is in all his impotent glory – GNK in the dock, getting convicted and sentenced on 30/7/12 (what, no smile for the camera?). (Every major media outlet, and every member of Parliament in New Zealand has now been sent this newslink). I arrived at the Waitakere District Court at around 9am and found GNK sitting with his daughter (aka GNK’s “human shield”) outside Courtroom 1 of the Waitakere District Court. On seeing me, GNK’s face fell, and I walked over to him and formally served the “Plaintiffs Information Capsule” on him in line with the Civil Claims process. GNK’s daughter leapt out of her seat, and in no uncertain terms (such language from one so young!) shouted at me to “leave my father alone”. GNK just sat there, watching his daughter rage. I ignored her, and directed my attention to GNK, advising him that, Court case or not, I was not yet finished with him, and that this saga still had some way to go. For once, he didn’t have a smart-arse comeback, no retort, he simply looked at me in what could best be described as dumb-struck fury. I invited GNK to be as brave with me in person as he had been hiding behind his keyboard, posting anonymous, untrue, and defamatory statements about me on his hate site. Again, GNK just sat there, and then stormed off to find a Security Guard to have me removed. I advised GNK that we were in a public space, and I could say and do pretty much whatever I liked. I then raised my voice to a level whereby everyone present could hear me, and began reciting a litany of some of the actions GNK had perpetuated on his victims – the audience took interest, and GNK took refuge in the Plaintiffs Information Capsule I had just served him. Not once would he meet my gaze. I then met with the Herald on Sunday media team, who had made an application to the Court for media coverage, and was also greeted by another of GNK’s victims, who had made quite a long trip to come and see GNK’s sentencing. When GNK discovered that another of his victims was in attendance, he moved seats, and turned his back on both the media and ourselves. I was watching a person in GNK experiencing his fantasy life shattering around him, as the reality of what was actually going on dawned on him – GNK’s mood shifted from indignant and petulant, to furtive and fearful – if there had been a hole in the ground that could have swallowed him, I am sure he would have welcomed it in that moment. Security guards eventually arrived, and informed King that as this was a public space, I was permitted to remain, although they cautioned me to keep my distance from King. On the arrival of the security guards, King glanced at the guards, and then got out of his seat, and attempted to summon some faux courage, ranting at me, knowing that I couldn’t get at him, and that the guards would protect him if I attempted to do so (he had said almost nothing to me at this stage). I smiled at him, acutely aware of what he was doing, observing his entrenched cowardice being once more on display for all to see. GNK’s Court case was not heard until around 11.45am, during which time I observed a tragic display of grief exhibited by GNK’s daughter at the circumstances her father was facing. 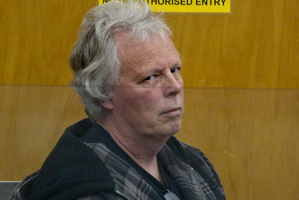 Quite why GNK has ever thought it was appropriate to drag his teenage daughter out of school and along to court hearings regarding his abjectly despicable behaviour towards others is frankly beyond me – the whole experience was obviously very distressing for her, and any care-parent with half a brain would recognise this fact, and not expose their children to such an environment or experience. GNK was eventually called up to the dock (helped along by an “up you go, scumbag” comment from me), and took his place in front of Judge Ryan. GNK had filed an objection to the Court regarding the media being present at his sentencing. GNK’s objection was based on his belief that media coverage of his sentencing and the story behind his sentencing would not be “reasonable, fair, or balanced” and would “negatively affect himself and his family”. The irony of GNK’s actions against his victims not being “reasonable, fair, or balanced”, and the “negative effect” GNK has had on other people’s families as a result of his actions was obviously lost on him at this juncture. The fact that GNK accepted absolutely no responsibility for his actions, and the natural consequences of same, was behaviour by GNK recognised as both tired and familiar to me, and many other victims. Judge Ryan asked the Herald on Sunday to justify their application to photograph GNK at the sentencing, and the Herald On Sunday representative was simply superb in their reply, proffering the theme of openness and transparency of Justice. Judge Ryan rejected GNK’s objection, granted the media application to photograph GNK, and the Herald on Sunday photographer happily snapped away (see above). Judge Ryan then reviewed the charges, and considered an application for Reparation to the victims of GNK while he was trading as NZ Sleepouts & NZ Kennels. The Judge’s decision was that GNK was not in a position to pay Reparation, by virtue of him being bankrupt, and declined to order Reparation on this basis (which was a pity, because Reparation Orders can survive bankruptcy proceedings, and the victims could have had their Reparation Orders enforced once GNK came out of bankruptcy, and began earning again). Judge Ryan was also restricted by previous cases (authorities) in this decision. In her sentencing Summary, Judge Ryan made a very interesting comment: “If I was looking at a long list of victims Mr King, you would be going to prison” (GNK was being charged with two indictable offences, the maximum sentence of which was 2 years imprisonment). Imagine if every victim of GNK had taken action against him in the past? Imagine how long the list would have been in front of Judge Ryan to contemplate in GNK’s sentencing? Then GNK did something quite unbelievable. Judge Ryan directly asked GNK what attempts he had made to do the right thing by the victims named on the summary sheet from the Ministry of Economic Development. GNK promptly perjured himself in reply (twice), and lied to Judge Ryan about the status of his attempts to put things right with two victims. While GNK lying to Judge Ryan made no material difference to his eventual sentence, it was simply gob-smacking to watch GNK do it – twice. GNK was then convicted and sentenced, and from a sentencing starting point of 350 hours Community Service, received a 25% sentencing discount for an early guilty plea, and received 262.5 hours Community Service for two charges of a breach of bankruptcy. At the conclusion of the sentencing, I ran into GNK’s daughter, who again screamed at me to “leave my family and my father alone – we are being hassled by everyone”. While it was saddening to me to watch her in her distress, I was mindful that it was ultimately her father’s actions, and not mine, that had been the genesis of her discomfort. The fact is, I would love to grant GNK’s daughter her plea – however, until her “father” both puts things right with my family, and until he stops inflaming the situation via his various defamatory actions against me, I will simply continue to monitor and pursue him until I am satisfied that justice has not only been done, but that justice has been seen to be done, just as I have over the past 8 months. Once my family & I have received full justice and appropriate compensation for the wrongs perpetuated by GNK upon me and my family, then I will go away – simple as that, really. “Before this story went public, King was invisible. He is not invisible any longer”. And in case GNK tries to play “silly buggers” with his Community Service sentence, and attempt to thwart the justice systems’ attempt to hold him to account, I have taken the precaution of writing to the Minister of Justice to advise the Department of Corrections to be mindful of GNK’s previous attempts to do so when he has received a Community Service conviction: Ministry of Justice Letter Response – Judith Collins (and we now know that Grant King did indeed try to play “silly buggers” with this Leaf Trust con attempt, whilst serving his Community Probation). No more hiding behind his enabling mates while claiming false Community Service hours working at Pony clubs for Mr King this time around. A big thank you to the Herald on Sunday for picking up and running with this story over the last 8 months; a big thankyou to the Ministry of Economic Development for successfully investigating and prosecuting GNK; and a big thankyou to the GNKASS Network who are the eyes and ears of this website – the collaborative efforts of all of you has made this happen. This entry was posted in Grant Norman King on August 4, 2012 by Steve Taylor. Awesome! Think I will have to buy a copy of the newspaper! I love your quote about him not being invisible anymore. Well done Steve!! Thanks Michelle, I appreciate your support. Nice photo, huh? Hi Marissa, thanks for your support. I am hopeful that some of Kings other victims may now feel more empowered to go after him and seek justice for themselves – if I can do it, so can they. Grant Norman King down, and just David William Swale to go. The real punishment will not be in the sentencing – it will be in the public exposure, because sunlight is indeed the best disinfectant when dealing with scumbags like King. The publicity will hopefully minimise the possibility of anyone else getting ripped off by King – as far as I know, King has not been able to scam anyone since I first launched this website in December 2011.